[In 2015, this became a limited edition flavor] I don't know about you, but I'm having a tough time coming out of the holiday slump. With five days off, it's hard to get the wheels turning again it seems. Case in point is this gelato review. I actually picked it up last Tuesday and dug right into it, I even had a story to go with it, but then I never got around to dumping the words from my cluttered brain onto this lovely blog here. Time for my admiration of Talenti to take another step towards trying every one of their flavors (especially when it's on sale for just $3.99!). This one here is Toasted Almond gelato. 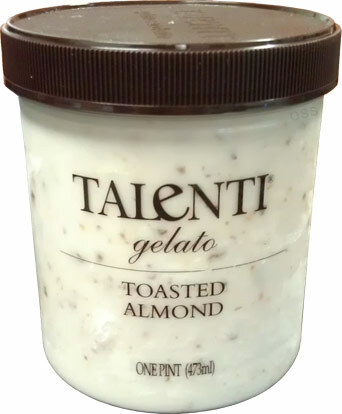 "Toasted, caramelized almonds intermix with Talenti's classic italian gelato and homemade almond butter. The finished flavor embodies the traditional salty and sweet culinary tradition". I don't love almonds, but for some reason, I need to try this one right now! Why does Talenti always have to look so tasty? Not only can I see through their unique plastic container**, but when I start to dig in I can't help but be impressed with the sight of almond bits everywhere. I could complain that they left the skins on the almonds, but it adds such a unique touch I can't help but like it. Do I like this flavor? Ofcourse I do! I will admit there is a small ramp up period until you settle in because almond just isn't a typical flavor. 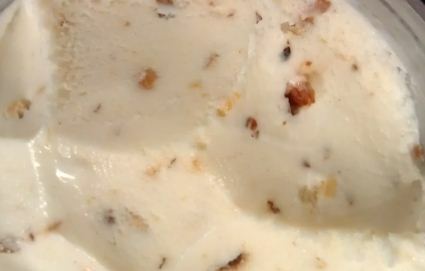 However, that familiar Talentio gelato texture sets in as I'm intrigued by all the almond bits everywhere. You get this fairly consistant and pleasant crunchiness to the whole thing. Straight almond flavor would have been boring, but the bits are here to sell you on this one. On a rare occasion you even get a whole almond (rare is a good thing as frozen almonds are kind of weird to chew). I've gone back for the second scoop and enjoyed it from the first bite. You know, I've noticed that on other Talenti flavors. It takes a few bites to settle in, but once you've decided you like a flavor, you are hooked. I'm no where near the fridge yet I can visualize eating this stuff. It leaves an impression, what can I say? ...sounds like they are paying me to say that, doesn't it? There's just something special about their texture. It's cold and solid, not too creamy, and that sounds like frozen milk, but it's not, it's so much better than that. Can I use the word clean to describe the texture? How about pure? Oh I do enjoy Talenti -- my wife isn't a convert yet (she's only had caramel cookie crunch), but I hope to get her their limited edition Egg Nog flavor before the season ends. **side note: My daughter uses the containers for digging in the dirt and we accidentally ran one of them over. Funny thing is, it's didn't shatter, instead it squished like an accordian. I like the stories, so keep them coming. As for this gelato...well, I wish I hadn't read this because I do like almonds a lot and now I've got another one to go seek out in the stores to try! I like the stories too! I've seen this in the store and have thought it looked good. Think I will have to try it now!